Hi, I’m Laura 😊 I’m 26 and originally hail from Durbanville, but have been living in Stellenbosch for 9 years. At the moment, I’m busy working towards my PhD in Chemistry. Probably arm balances – the fear of falling on my face is too high! What first got you onto the mat? 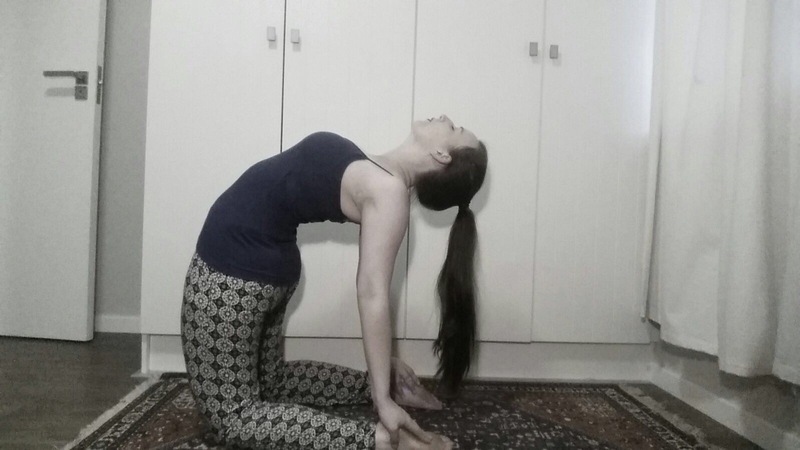 I first started yoga in 2013, at the beginning of my PhD. I’d been diagnosed with major depressive disorder together with anxiety. My doctor and therapist both recommended taking up yoga so I did – and after my first class, that was it, I never looked back! Yoga has been a very important tool in helping me cope both with depression and with the stress of the PhD. I love the calm that comes with meditation. I love how following my breathing helps me take control when anxiety tries to overpower. I love how being in touch with my body’s movements helps me feel at peace with it, instead of trapped in it. I love how yoga makes me feel powerful instead of powerless. Where do you practice mostly and why? While I mostly do home practice these days, I love getting the chance to attend a class. The teachers at Yoga With Nicci are so friendly and helpful, especially when it comes to adjustments or modifications of poses. Plus, there is something special about lying in savasana and just listening to the wind and the trees outside the small studio.